Dr. Emara received her M.A. and her Ph.D. in Economics from Rutgers University, The State University of New Jersey, New Brunswick. Upon finishing her Ph.D., Dr. Emara served as a Term Assistant Professor of Economics at Barnard College, Columbia University where she has taught Economic Reasoning, Econometrics, Money and Banking, Labor Economics, and Development Economics. 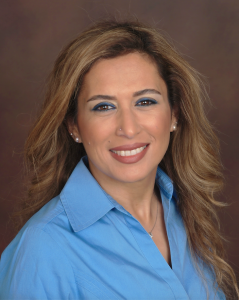 Dr. Emara also taught courses at Drew University, Rutgers University-New Brunswick, and Helwan University. Among the course she has taught at the three universities are Econometrics, Mathematical Economics, Economic Fluctuations, Money and Banking, and Intermediate Macro. Her current research program includes five streams of research suitable for peer-review: (1) explorations of the impact of governance and economic freedom on economic growth; (2) explorations of development in developing countries; (3) examinations of monetary and financial issues; (4) papers related to predictions and forecasting; and (5) co-authored microeconomics papers in which she supplied the econometrics part. Primary Fields: Applied Econometrics, Economic Development, and Macroeconomic Policy. Secondary Fields: Health Economics, Applied Microeconomics, and Financial Economics. Does Voting on Team Compensation Increase Team Effort? 2017, with Sean Duffy, Tyson Hartwig, and John Smith. On the Impact of Macroprudential Policy in Selected MENA Economies, 2017, with Ayah El Said. Sovereign Ratings and Foreign Direct Investment in Emerging Markets, 2017, with Ayah El Said. Financial Development, Access to Finance, and Economic Growth: The Case of Selected MENA Countries, 2017, with Ayah El Said. On the Relationship Between Economic Freedom and Output Per Worker, 2017. Sound Governance and Economic Growth/Using Quantile Regression Approach to Evaluate How Composite Governance Index Affects Economic Growth Countries, 2017, with I-Ming Chiu. Serial Correlation in National Football League Play Calling and its Effects on Outcomes, 2017, with David Owens, John Smith, and Lisa Wilmer, Journal of Behavioral and Experimental Economics, 69, 125-132. Economic Freedom and Economic Performance: The Case MENA Countries, 2016, Journal of Middle East and North Africa Sciences, 2(2): 1-15. The Impact of Governance Environment on Economic Growth: The Case of Middle Eastern and North African Countries, 2016, with I-Ming Chiu, Journal of Economics Library, 3(1): 24-37. Fertility and Female Employment: A Panel Study on Developing Countries, 2016, Applied Economics and Finance, 3(2): 122-127. Estimating Aggregate Demand in Egypt, 2016, with Elise Mordos and Sonika Tyagi, Journal of Economics and Political Economy, 3(1): 50-64. Commodity Price Changes and Economic Growth in Developing Countries, 2015, with Tricia Jamison and Amon Simutowe, Journal of Business and Economics, 6(10): 1707-1712. Revisiting Sovereign Ratings, Capital Flows, and Financial Contagion in Emerging Markets, 2015, with Ayah El Said, World Journal of Applied Economics, 1(2): 3-22. Income Elasticity and the Gender Gap: A Challenging MDG for the MENA Countries, 2014, Review of Middle East Economics and Finance, 10(3): 263-292. Governance and Economic Growth: The Case of Middle East and North African Countries, 2014, with Eric Jhonsa, Journal of Development and Economic Policies, 16(1): 47-71. Effect of Income Elasticity on MDG Health Indicators: The Case of MENA Countries, 2014, with Rebecca Moore, Review of Middle East Economics and Finance, 10(1): 53-73. Predictive Ability of Three Different Estimates of “Cay” to Excess Stock Returns—A Comparative Study between South Africa and U.S., 2014, European Research Studies Journal, 17(1): 3-17. Forecasting Excess Stock Returns–A Comparative Study between U.S. and Germany, 2014, The Journal of American Academy of Business, 19(2): 1-8. The Impact of Commodity Price Changes on Economic Growth in Developing Countries: An Empirical Investigation 1980-2010, 2014, with Tricia Jamison and Amon Simutowe, The Scientific Journal for Research and Commercial Studies (in Arabic), 2(1): 43-65. Foreign Aid and Growth in Egypt: The Role of Economic Policy, 2013, with David Plotkin and Alyssa Stein, Journal of Business and Economics, 4(11): 1170-1175. The Welfare Effects of Inflation Volatility and Institutions: Implications for Emerging Market Economies, 2012, Global Journal of Emerging Market Economies, 4(1): 5-27. Inflation Volatility, Financial Institutions, and Sovereign Debt Rating, 2012, Journal of Development and Economic Policies, 14(1): 29-53. Inflation Volatility, Institutions, and Economic Growth, 2012, Global Journal of Emerging Market Economies, 4(1): 29-53. Current U.S. Financial Crises: Origins, Consequences, and Remedies, 2009, with Marwa Hassan, in Akinori Tomohara and Molly Sherlock (eds. ), Financial Crisis in the Global Bubble Economy, 1-42. New York, NY: Nova Science Publishers. The Impact of Sudden Stops in Capital Flows on Output: Selected Emerging Markets, with Congcong Ni and Ya Gao, Northeast Business and Economics Association, 44th Annual Meeting, October 26­–28, 2017, Port Jefferson, New York, USA, forthcoming. Government Spending on Education and Closing the Gender Gap: The Case of Developing Economies, with Azza Hegazy, Northeast Business and Economics Association, 43rd Annual Meeting, November 10-12, 2016. Published Proceedings, West Point, New York, U.S.A. The Impact of Governance on Economic Growth: The Case of Middle Eastern and North African Countries, 2016, with I-Ming Chiu, Topics in Middle Eastern and African Economies, Middle East Economic Association and Loyola University Chicago, May 18, year. Does Voting on Compensation Increase Team Effort?, 2016, with Sean Duffy, Tyson Hartwig, and John Smith, MPRA Paper 58907, University Library of Munich, Germany. An Analysis of the Seasonal and Business Cycles, with Jinpeng Ma, Northeast Business and Economics Association, 42nd Annual Meeting, November 5-7, 2015. Published Proceedings, Jamaika, New York, U.S.A.
Revisiting Sovereign Ratings, Capital Flows, and Financial Contagion in Emerging Markets, with Ayah El Said, 2nd International Conference in Economics, August 18-20, 2015. Published Proceedings, EconWorld, Torino, Italy. Revisiting Sovereign Ratings, Capital Flows, and Financial Contagion in Emerging Markets, with Ayah El Said, Northeast Business and Economics Association, 41st Annual Meeting, November 6-8, 2014. Published Proceedings, West Long Branch, New Jersey, U.S.A. Governance and Economic Growth: Interpretations for MENA Countries, 2014, Topics in Middle Eastern and African Economies, Middle East Economic Association and Loyola University Chicago, 16(2). Quantitative Evaluation of the Struggle of Economic Performance: The Case of MENA Countries, 2014, Topics in Middle Eastern and African Economies, Middle East Economic Association and Loyola University Chicago, 16 (2). 2014 Predictions for Your Wallet, December 11, 2013, WalletHub. Fertility and Female Employment: A Panel Study on Developing Countries, Northeast Business and Economics Association, 40th Annual Meeting, November 7-9, 2013. Published Proceedings, Bretton Woods, New Hampshire, U.S.A.
Predictive Ability of Three Different Estimates of “Cay” to Excess Stock Returns—A Comparative Study and South Africa & U.S., International Conference on Applied Business and Economics, October 2-4, 2013. Published Proceedings, Manhattan, New York, U.S.A.
Foreign Aid and Growth in Egypt: The Role of Economic Policy, with David Plotkin and Alyssa Stein, Northeast Business and Economics Association, 39th Annual Meeting, October 25-27, 2012. Published Proceedings, Port Jefferson, Long Island, New York, USA. Consumption, Wealth, and Stock Returns, with Demet Tunali, Northeast Business and Economics Association, 39th Annual Meeting, October 25-27, 2012. Published Proceedings, Port Jefferson, Long Island, New York, U.S.A. Governance and Economic Growth: The Case of Middle East and North African Countries, with Eric Jhonsa, Northeast Business and Economics Association, 38th Annual Meeting, November 3-5, 2011. Published Proceedings, Philadelphia, Pennsylvania, U.S.A.
Quantitative Evaluation of the Struggle of Economic Performance: The Case of MENA Countries.Northeast Business and Economics Association, 38th Annual Meeting, November 3-5, 2011. Published Proceedings, Philadelphia, Pennsylvania, U.S.A. The 2007 U.S. Recession: Between Forecast and Recovery, with Marwa Hassan, Northeast Business and Economics Association, 37th Annual Meeting, September 30-October 2, 2010. Published Proceedings, Morristown, New Jersey, U.S.A.
Inflation Volatility versus Institutions: A Growth and Development Study 2009. Saarbrucken, Germany: VDM Publishing House Ltd.
Business Cycles and Seasonal Patterns, 2017, with Jinpeng Ma, submitted. Government Spending on Education and Closing the Gender Gap: The Case of Developing Economies, 2017, with Azza Hegazy, submitted. Determinants of Health and Education in Latin American Countries, 2016, with Evelyn Morfin, submitted. Sound Governance and Economic Growth/Using Quantile Regression Approach to Evaluate how Composite Governance Index Affects Economic Growth Countries, with I-Ming Chiu, The Eastern Economic Association 43rd Annual Conference, February 23–26, 2017, New York, New York, U.S.A.
Monetary and Macroprudential Polices in Thailand, Malaysia and the Philippines, The 5th International Conference on Global Challenges in Social Sciences, Humanities, Management, and Business Studies, February 6-7, 2017, Cairo, Egypt. Financial Development, Access to Finance, and Economic Growth: The Case of Selected MENA Countries, with Ayah El Said, The 37th Annual Meeting of The Middle East Economic Association, Allied Social Science Associations,January 5-8, 2017, Chicago, Illinois, U.S.A.
Government Spending on Education and Closing the Gender Gap: The Case of Developing Economies, with Azza Hegazy, Northeast Business and Economics Association 43rd Annual Meeting, November 10-12, 2016, West Point, New York, U.S.A.
Economic Freedom and Economic Performance: The Case of MENA Countries, with Constantine Alexandrakis, The 11th Annual International Symposium on Economic Theory, Policy and Applications, July 18-21, 2016, Athens, Greece. Monetary vs. Macroprudential Tools: The Case of Five Asian Countries, Eastern Economic Association 42nd Annual Conference, February 25-28, 2016, Washington, D.C., U.S.A. The Impact of Governance on Economic Growth: The Case of Middle Eastern and North African Countries, with I-Ming Chiu, The 36th Annual Meeting of The Middle East Economic Association, Allied Social Science Associations, January 3-6, 2016, San Francisco, California, U.S.A.
An Analysis of the Seasonal Cycle and the Business Cycle, with Marwa Hassan, , with Jinpeng Ma, Northeast Business and Economics Association 42nd Annual Meeting, November 5-7, 2015, Jamaika, New York, U.S.A.
Revisiting Sovereign Ratings, Capital Flows, and Financial Contagion in Emerging Markets, with Ayah El Said, 2nd International Conference in Economics, August 18-20, 2015, Torino, Italy. An Analysis of the Seasonal and Business Cycles, with Jinpeng Ma, Eastern Economic Association 41st Annual Conference, February 26-March 1, 2015, New York, U.S.A.
On the Impact of Macroprudential Policy in Selected MENA Economies, with Ayah El Said, 35th Annual Meeting of The Middle East Economic Association Allied Social Science Associations,January 3-6, 2015, Boston, Massachusetts, U.S.A.
Revisiting Sovereign Ratings, Capital Flows, and Financial Contagion in Emerging Markets, with Ayah El Said, Northeast Business and Economics Association 41th Annual Meeting, November 6-8, 2014, West Long Branch, New Jersey, U.S.A.
Foreign Direct Investment and Economic Growth, The 2nd International Interdisciplinary Business-Economics Advancement Conference, July 16-19, 2014, Istanbul University, Istanbul, Turkey. Revisiting Sovereign Ratings, Capital Flows, and Financial Contagion in Emerging Markets, with Ayah El Said, Eastern Economic Association 40th Annual Conference, March 6-9, 2014, Boston, Massachusetts, U.S.A.
Quantitative Evaluation of the Struggle of Economic Performance: The Case of MENA Countries, with Marwa Hassan, Eastern Economic Association 40th Annual Conference March 6-9, 2014, Boston, Massachusetts, U.S.A. Governance and Economic Growth: The Case MENA Countries, Middle East Economic Association 34th Annual Meeting in conjunction with the Allied Social Science Association, January 3-6, 2014, Philadelphia, Pennsylvania, U.S.A.
Economic Freedom and Economic Performance: The Case MENA Countries, Middle East Economic Association 34th Annual Meeting in conjunction with the Allied Social Science Association, January 3-6, 2014, Philadelphia, Pennsylvania, U.S.A.
Predictive Ability of Three Different Estimates of “Cay” to Excess Stock Returns—A Comparative Study and South Africa & U.S., The International Conference on Applied Business and Economics, October 2-4, 2013, Manhattan, New York, U.S.A. Fertility and Female Employment: A Panel Study on Developing Countries, Northeast Business and Economics Association 40th Annual Meeting, November 7-9, 2013, Bretton Woods, New Hampshire, U.S.A. Consumption, Wealth, and Stock Returns, with Demet Tunali, Northeast Business and Economics Association 39th Annual Meeting, October 25-27, 2012, Long Island, New York, U.S.A.
Foreign Aid and Growth in Egypt: The Role of Economic Policy, with David Plotkin and Alyssa Stein, Northeast Business and Economics Association 39th Annual Meeting, October 25-27, 2012. Port Jefferson, Long Island, New York, U.S.A.
Income Elasticity of Health Indicators within the MDGs: Estimation and Projection—MENA Case Study, with Rebecca Moore, Eastern Economic Association 38th Annual Conference, March 9-11, 2012, Boston, Massachusetts, U.S.A.
Quantitative Evaluation of the Struggle of Economic Performance: The Case of MENA Countries, with Marwa Hassan, Northeast Business and Economics Association 38th Annual Meeting, November 3-5, 2011, Philadelphia, Pennsylvania, U.S.A.
Bayesian Estimation of the Welfare Effects of Inflation Volatility and Institutions in a Monetary Small Open Economy, with John Landon-Lane, 45th Annual Conference of the Canadian Economic Association, Ottawa University, June 2-5, 2011, Ottawa, Canada. Welfare Implications of Inflation Volatility and Institutions: Implications for Emerging Market Economies, Eastern Economic Association 37th Annual Conference, February 25-27, 2011 New York, New York, U.S.A. The 2007 U.S. Recession: Between Forecast and Recovery, with Marwa Hassan, Northeast Business and Economics Association 37th Annual Meeting, September 30-October 2, 2010, Morristown, New Jersey, U.S.A. Welfare Implications of Inflation Volatility and Financial Institutions in a Monetary Small Open Economy: The Case of Mexico, Econometric Modeling for Africa 15th Annual Conference, The American University in Cairo, July 7-9, 2010, Cairo, Egypt. Gender Gap and Economic Growth: A Challenging MDG for the MENA Countries, Econometric Modeling for Africa 15th Annual Conference, The American University in Cairo, July 7-9, 2010, Cairo, Egypt. Inflation Volatility, Financial Institutions, and Sovereign Debt Rating, Eastern Economic Association 36th Annual Conference, February 26-28, 2010, Philadelphia, Pennsylvania, U.S.A.
Inflation Volatility, Financial Institutions, and Sovereign Debt Rating, Macroeconomic Theory Workshop, Department of Economics, Rutgers University, October 2008, New Brunswick, New Jersey, U.S.A. Welfare Implications of Inflation Volatility and Financial Institutions in a Monetary Small Open Economy: The Case of Mexico, Macroeconomic Theory Workshop, Department of Economics, Rutgers University, September 2008, New Brunswick, New Jersey, U.S.A.
Access to Finance in Selected Developing Countries, with Ayah El Said, Eastern Economic Association 44th Annual Conference, February 23-26, 2018, Boston, Massachusetts, U.S.A.
Financial Inclusion and Economic Growth: The Role of Governance In Selected MENA Countries, with Ayah El Said, Middle East Economic Association 38th Annual Meeting in conjunction with the Allied Social Science Association, January 4-7, 2018, Philadelphia, Pennsylvania, U.S.A.
Financial Stability and Economic Growth: Does Exporting Oil Matter? with I-Ming Chiu, Middle East Economic Association 38th Annual Meeting in conjunction with the Allied Social Science Association, January 4-7, 2018, Philadelphia, Pennsylvania, U.S.A. The Impact of Sudden Stops in Capital Flows on Output: Selected Emerging Markets, with Congcong Ni and Ya Gao, Northeast Business and Economics Association, 44th Annual Meeting, October 26­–28, 2017, Port Jefferson, New York, USA. On the Impact of Macroprudential Policy in Selected MENA Economies, with Ayah El Said, International Conference on Social Science and Economics, July 23-24, 2017, Mecca, Saudi Arabia. Page last updated by Department of Economics at 10:06 am August 24, 2018 . This page was printed from http://economics.camden.rutgers.edu/faculty/noha-emara/ at 10:47 PM Thursday, April 25, 2019.